King County monitors the ecological health of Longfellow Creek in a variety of ways, including collecting and analyzing water and sediment samples. Water quality samples have been collected monthly from Station C370 located at the footbridge on SW Yancy Street, near 28th Ave SW. Sampling began in 1979 and continued until 2008 when regular monitoring was discontinued due to budget cuts. However, sampling at station C370 resumed in February 2013. In 1992, another water quality station (J370) was added further upstream at Brandon Street, but monitoring at this site ended in 2008. Sediment samples have been collected from Longfellow Creek as part of the Streams Sediment Monitoring Program starting in 1987. From time to time, additional studies have been conducted on Longfellow Creek. Click here for information about Special Studies. 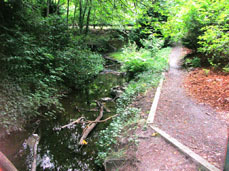 The Longfellow Creek subbasin is comprised of roughly 2,685 acres in the neighborhood of West Seattle, Washington within the Water Resource Inventory Area (WRIA) 9. The creek flows for approximately 4.2 miles through heavily urbanized areas into the West Duwamish Waterway (Kerwin and Nelson, 2000). Currently, the upper 4,900 feet of the creek has been diverted into underground pipes and roughly one third of the total creek flow drains through pipes beneath shopping centers, houses, and roads. The headwaters of Longfellow Creek were historically located in a natural wetland and peat bog in what is now Roxhill Park (Kerwin and Nelson, 2000). The Roxhill bog was recently restored with the completion of the Longfellow Creek Legacy Trail in West Seattle. Total land use is almost entirely developed. Development ranges from low to high intensity, medium intensity being the most common, and open space. Some forest land exists and is mostly deciduous. Less than 1% of the land is (woody) wetlands. There is no agriculture, scrub, or other land use (such as grassland or barren land). See Table 1 below for more details on land use. Historically, Longfellow Creek contained populations of coho salmon, cutthroat trout, and steelhead trout (Kerwin and Nelson, 2000). In 1999, Seattle Public Utilities conducted spawning surveys on Longfellow creek and noted the presence of 60 adult coho salmon. In addition, juvenile rainbow trout and coho salmon were captured during electrofishing surveys in 1999 by Wild Fish Conservancy (previously known as Washington Trout). Numerous groups have released coho fry into the creek over the years. Longfellow Creek has two small-unnamed tributaries. These tributaries are believed to be too small for anadromous fish use, but may be important refuge for over wintering salmonids during periods of high flow. Key findings in the Habitat-limiting Factors and Reconnaissance Report (Kerwin and Nelson, 2000) identified extensive channelization, severely altered hydrologic regime, lack of instream structures, habitat barriers, quality and quantity of gravels, and poor water quality as some of the factors affecting anadromous fish in Longfellow Creek. Beginning 2001, the National Oceanic and Atmospheric Administration's (NOAA) Northwest Fisheries Science Center has been studying coho pre-spawn mortality in urban streams of the Puget Sound Basin. Longfellow Creek is part of this study. Fish suffering from pre-spawn mortality show behavioral symptoms that are indicative of an underlying neurological or respiratory disorder. Fish with the disorder exhibit loss of orientation, followed by loss of equilibrium, and eventual death. Volunteers in the King County Salmon Watcher Program have been making observations in Longfellow Creek beginning 1999 and have consistently sighted coho and chum salmon. Chinook salmon and cutthroat trout have also been spotted on occasion. State water quality standards were revised in 2003. Longfellow Creek is now categorized as “Salmonid Spawning, Rearing and Migration Habitat” for aquatic life use. The creek is designated as “Extraordinary Contact” for recreational use. As part of the updated water quality standards, portions of Longfellow Creek have been assigned an additional “Supplemental Spawning and Incubation Protection” temperature criteria of 13 °C to be applied from September 15th to May 15th. Both sampling sites are listed on the Washington State Department of Ecology’s (Ecology) 303(d) list for violation of water temperature, DO, and FC bacteria standards (Category 5). A 25-year (1979 – 2004) trend analysis was conducted with baseflow water quality data from station C370 showed some significant changes in the water quality since 1979. Improvements in water quality over this time period are indicated by a significant decrease in temperature and an increase in dissolved oxygen concentrations. Water in Longfellow Creek is becoming more acidic as indicated by the significant decrease in pH. However, the pH remains within acceptable range relative to the state standards. Water quality declined with regards to nutrient enrichment as there was a significant increase in total phosphorus and total nitrogen. A Water Quality Index (WQI) rating system was developed by Ecology that evaluates several water quality parameters and gives a single rating of “high,” “moderate,” or “low” water quality concern. To see how Longfellow Creek ratings compare with other stream sites, please visit the Water Quality Index webpage. King County is not currently operating any stream, precipitation, or temperature gages in Longfellow Creek. Sediment samples were collected from one location along Longfellow Creek in the summer of 2004 (see map). Concentrations of detected chemicals in all samples were below all sediment quality guidelines, suggesting little potential for adverse effects in sediment-dwelling organisms. King County has not conducted regular benthic macroinvertebrate sampling on Longfellow Creek. However, the City of Seattle, Washington has occasionally monitored benthos populations in Longfellow Creek. To see this data for Longfellow Creek, please visit the Puget Sound Stream Benthos webpage. Volunteers trained by Puget Soundkeeper conducted daily surveys recording live coho sightings and coho behavior from October to December 2016. Volunteers also performed necropsies on coho carcasses. Results found that for the 2016 run pre-spwan mortality in female coho was 48%, which was lower than observations from previous years. Decreased pre-spawn mortality may be due to increased rainfall and restoration efforts in Longfellow Creek. Between 2000 and 2011, researchers from NOAA's Ecotoxicology and Environmental Fish Health Program collaborated with U.S. Fish and Wildlife Service, local tribes, and the Wild Fish Conservancy to investigate the problem of coho pre-spawn mortality in urban streams of the Puget Sound Basin. Researchers found that stormwater pollution in 40% of coho home range can cause death. Due to such high death rates, stormwater pollution is putting some wild coho populations at risk for local extinction.